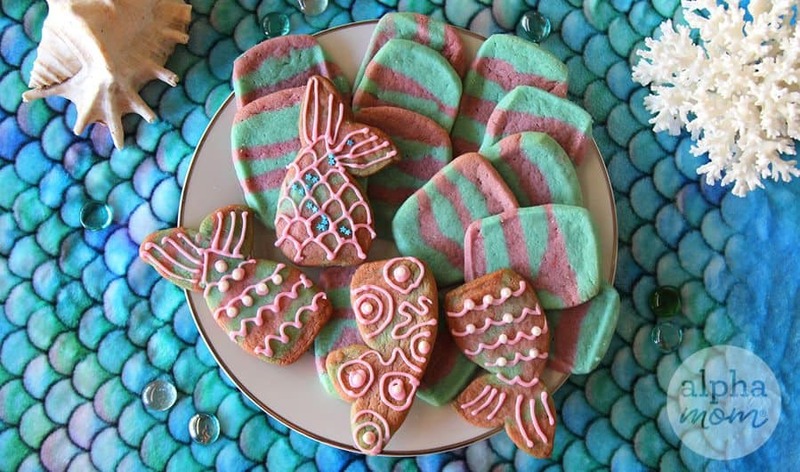 We are deeply into all things mermaids this summer at our house so we decided to make some mermaid-inspired icebox cookies. Is there such a thing as a mermaid colors? Well, my girls seem to think so… they think pink and teal. They also believe in “unicorn colors” (ROYGBIV). 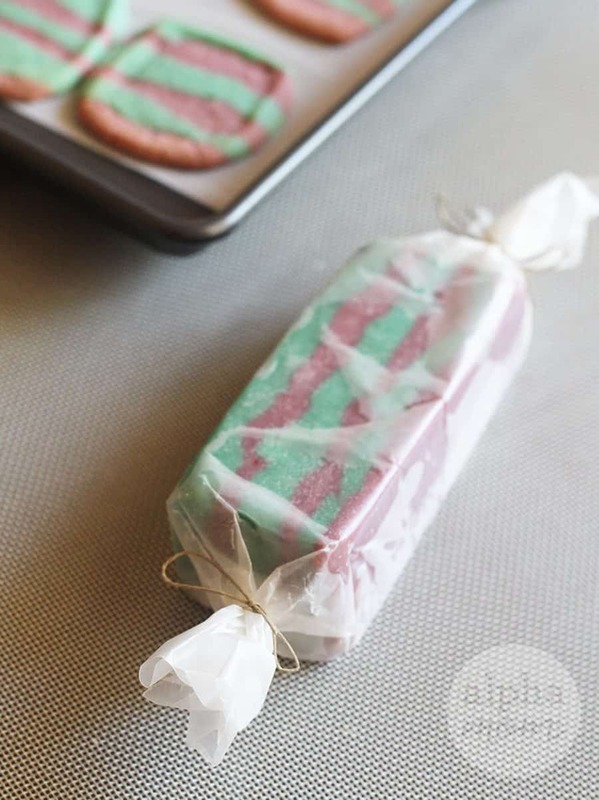 You can make striped icebox cookies with any colors (not just the ones we chose, obviously) with these easy steps below! MMMmmmmm stripes. They totally taste better. First make your dough. Color each batch a different color. 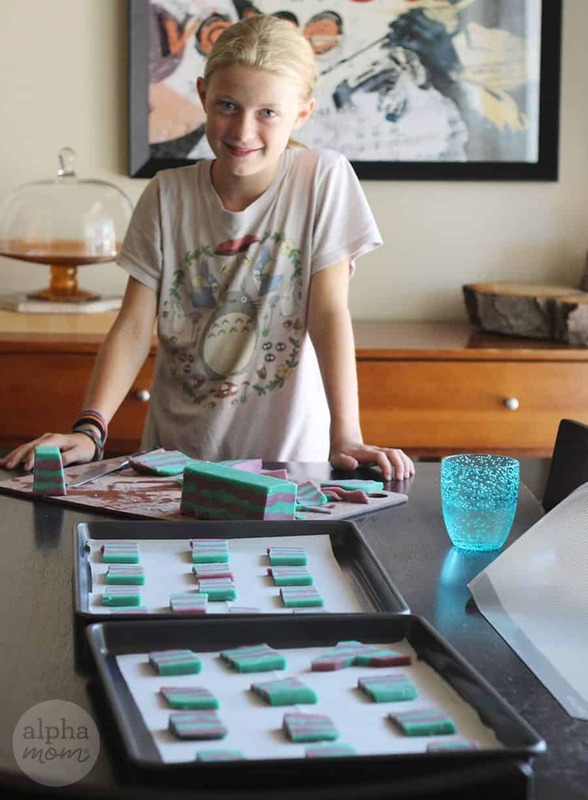 For our teal-colored dough we used seven drops of blue food coloring and five of green but you can use any food coloring you like, even natural food coloring. For the purple we used four drops of neon pink food coloring, one drop of red and one drop of blue. We mixed the coloring in throughly with a mixer to avoid getting our hands dyed. Then we lined our loaf pan with wax paper and started with our first layer of teal dough. Spoon in about an inch of dough and smooth it down inside the loaf pan with a spoon. Then we added purple and did the same thing. Repeat until you’ve filled the loaf pan all the way to the top with even layers of dough. Pop it in the refrigerator for an hour or more! This step is crucial. Once our dough was good and chilled we turned our loaf pan upside down onto a cutting board and sliced it in half with a knife (use your common sense and judgment; if your kid is too young to handle, an adult should handle this step and the knife) so that we had two long rectangles. We trimmed off some of the edges to make them nice and sharp on the edges. 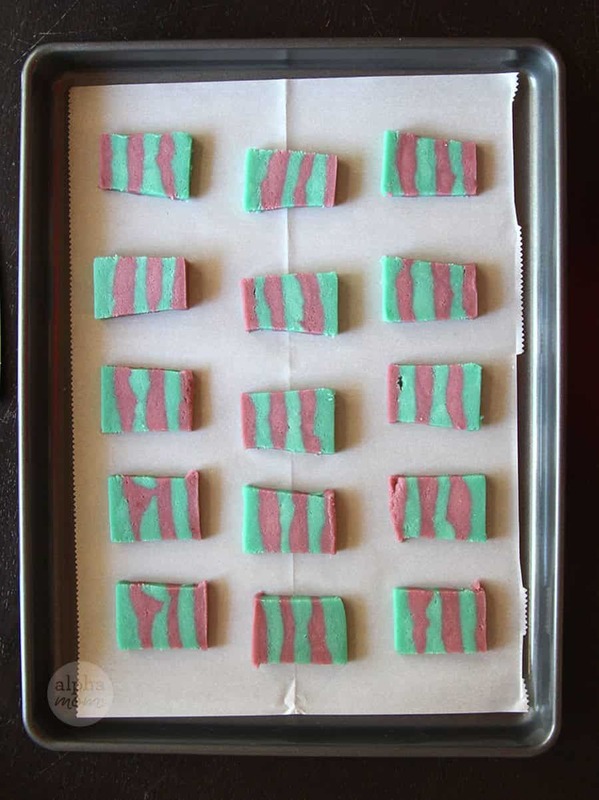 Then we sliced our long rectangles into individual cookies and placed them onto a cookie sheet. They looked so cute all spread out on the cookie sheet. 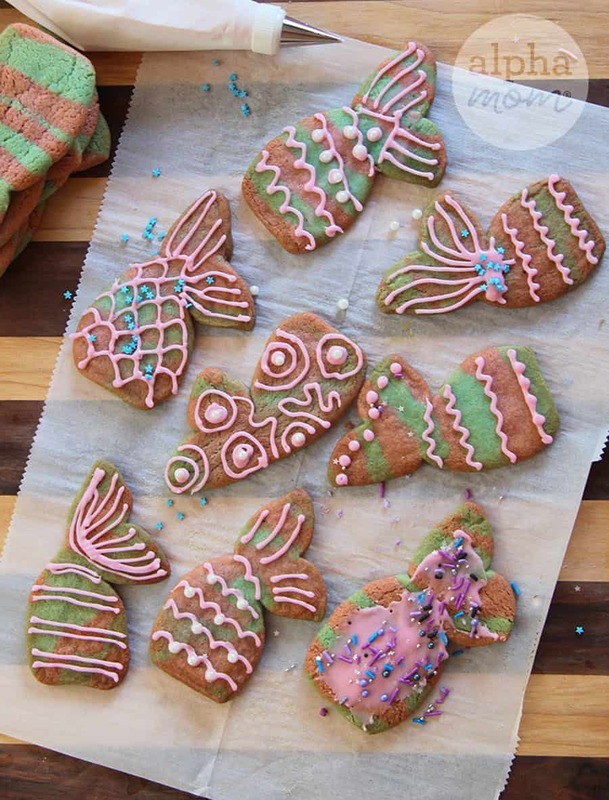 Make sure to allow enough room in between each cookie because they will rise and spread when they bake. Then we baked them per the sugar cookie dough recipe. 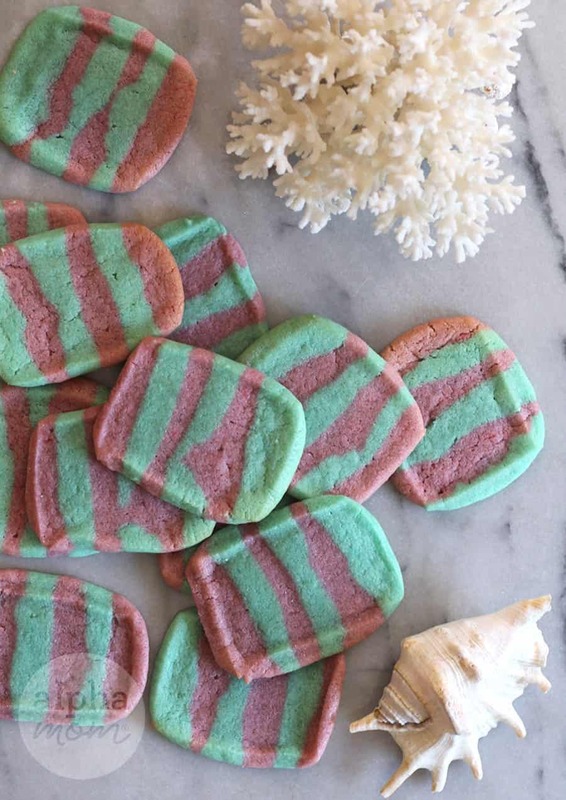 I always thought icebox cookies meant they were nice and cool for the summer but sadly, these cookies will heat up your house just like any other baking treat. 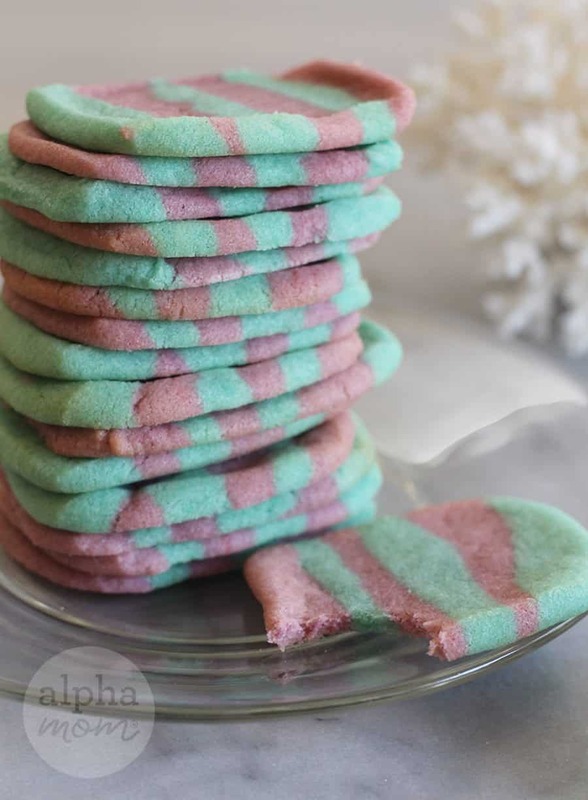 They are called icebox cookies because you can keep the dough in the refrigerator aka icebox. You can make them anytime you like just take your chilled dough out of the refrigerator and slice up how ever many cookies you like. 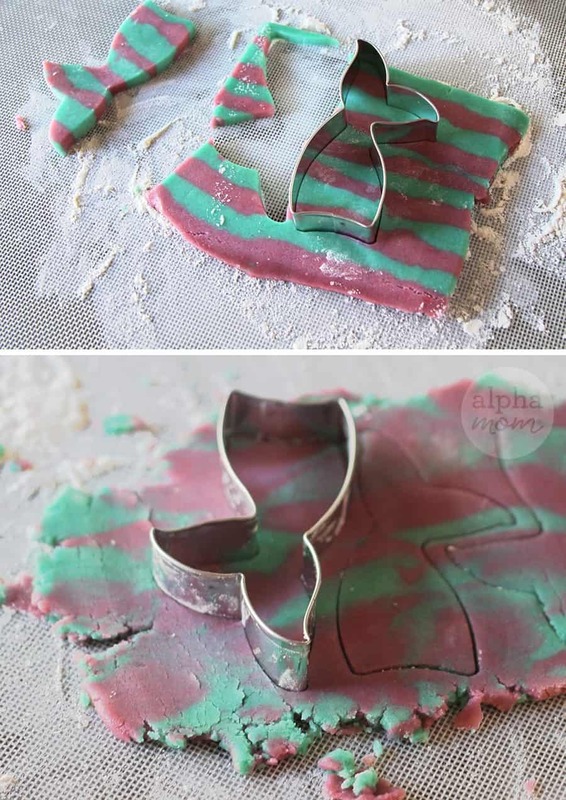 You can even freeze the dough and make them months later! Like maybe right before a pool party with all your mermaid friends! 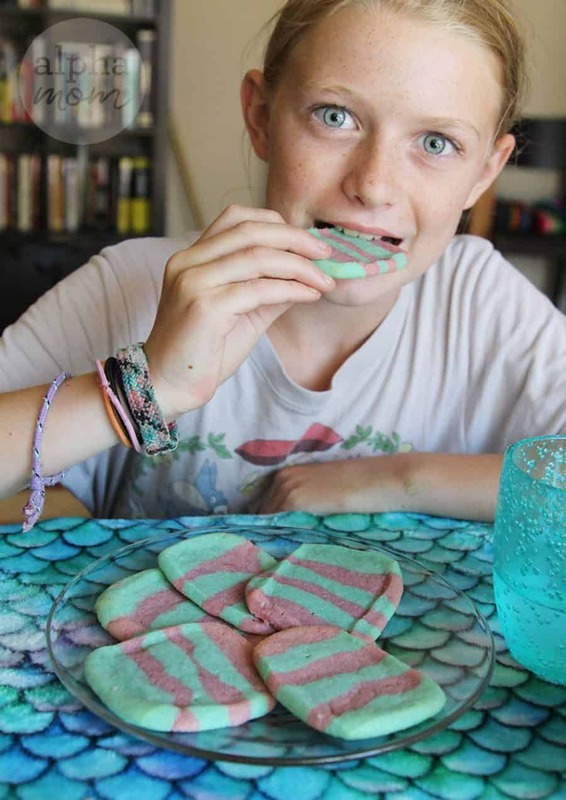 On another day you might want to squish your striped mermaid dough together and roll it carefully into a sheet so that you can use a mermaid tail cookie cutter. Imagine the possibilities! You could ice them and add sprinkles. Almost too pretty to eat. 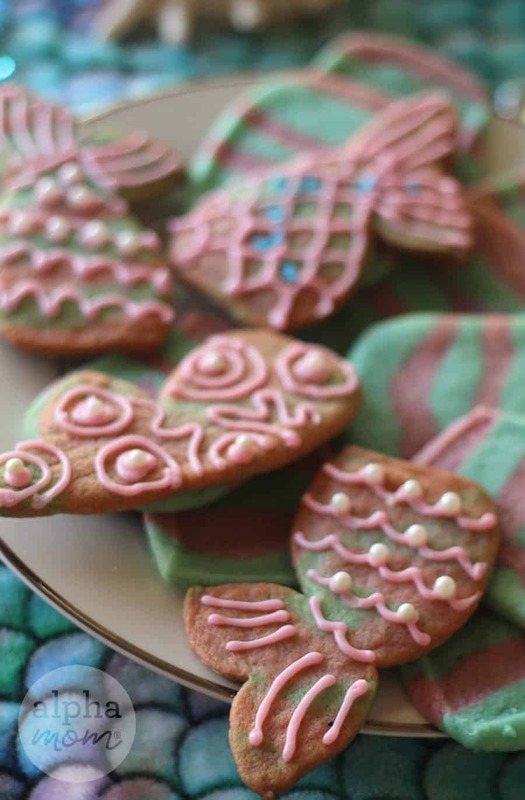 Hope you enjoy making these Mermaid icebox cookies as much as we did!